The organic WordPress theme is the best way to implement agriculture, foods, healthy shops, gastro agency and much more related to an organic WordPress theme, in this article we have done a deep analysis of Best WordPress Theme for Organic Food Product with features and demos. Definitely, you might be interested in any theme which listed below to engage your audience. All the theme which we have listed here meet all the recommended process and compatible with the latest version of WordPress and all browsers. In addition 100% fully responsive layouts with easy editable and customizable framework that gives more power to each theme. So let’s jump into the article. Organic store is a colorful organic WordPress theme with a modern and responsive design. Specifically, design for natural food related websites, agriculture business website, healthy food blog, gastro-tourism and healthy food shops with real-time features to make use of it. As well as the organic store is a great selection for the dairy farm, cheese farm, grape farm, corporate eco product store, and fresh bakery stores. The theme includes of 4 different and unique homepage layouts with stunning looking and navigation with easy customization option. As well as it has a wonderful and visual interface that looks more informative in all devices including mobile, desktop and tablets. Organic store theme also offering WPBakery page builder (visual composer) for a male your own page and edit pre-built pages without any coding knowledge and just by drag and drop features. In addition, it’s providing some of the essential plugins including WPML to translate your website into multilingual, essential grid which is number one plugin for making the unlimited design of grid layouts that looks stunning. And greatly support for WooCommerce plugin to make and manage your shop page to make online cash with minimal requirements. Make your homepage more beautiful by simply integrating slider revolution which included with the package. More features from the organic store, powerful admin theme option to monetize your website drag and drop page builder and free supports and update with well documenting. 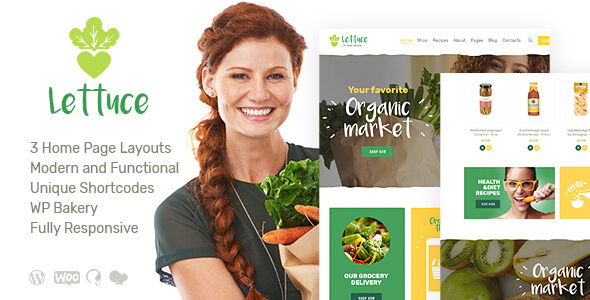 Lettuce is a modern and dynamic WordPress theme with responsive layouts and design templates. Specifically suitable for organic food WordPress websites such as natural foods website, agricultural business, healthy blog and much more. 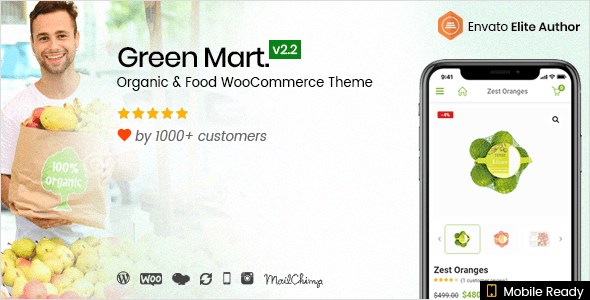 The lettuce organic WordPress theme offering fully compatible WooCommerce store with realistic monetize option to make some extra cash online without any additional skills. Whether you love or not it has a quality recipe management system to accurately manage the recipe and tools in advanced. Beautiful portfolio galleries and powerful shortcodes to build additional features and widgets that can lead the usability of the website among new and old users. One click demo installation allows building your website under one minute and ready to launch just in one click, awesome isn’t. Optimized with all devices like scrollable swipe effects, mobile-friendly slider and 100* fully responsive and retina ready features. WPBakery page builder support to make your homepage and custom page more and more elegant with drag and drop page builder with no more time spends. No coding required to make any modification on Lettuce theme and easily edit and customize it as per your requirements. Ready for search engine optimization with high-quality HTML codes. And more features available for real buyers such as Easy update and support, tons of shortcodes, WPML for multilingual, parallax effects and customizable google map. 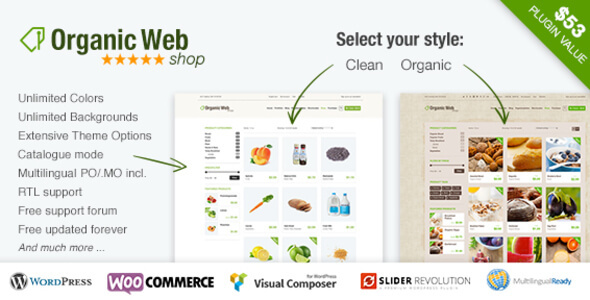 Organic web shop – an organic and responsive WooCommerce food and eco WordPress theme. 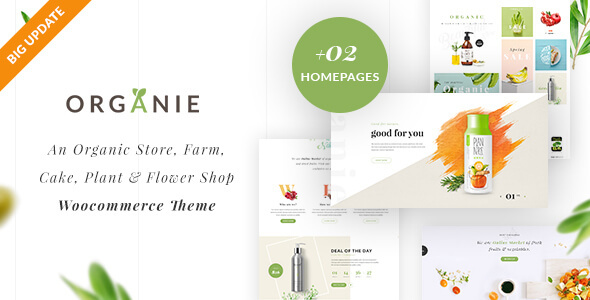 The organic webshop is a premium e-commerce WordPress theme for various websites such as food, fruits, cosmetics, seeds, coffee and much more. This theme comes up with essential and recommended features with a variety of customization theme option that looks more inclusive. Organic web shop allows to create your own shop page with WooCommerce integration, it’s also used Ajax technology to add to cart feature without reloading the page to improve the website speed and performance. 100% fully responsive design and optimized codes for laptops, tablets, mobiles, and optional HiDPI logo. And the great feature, it also offering visual composer page builder to create your stunning homepage and custom pages with drag and drop features, integrated slider revolution plugin to make an awesome looking slider to your homepage design. Use the extensive theme options panel to change the color, element, typography, fonts, image and footer and much more. WPML plugin support to translate your website into multilingual. In addition, the WooCommerce plugin offering more features to Organic web shop themes such as currency converter, multiple payment options like PayPal, direct bank transfer and cheque payments. Pre-built user review system for each product and multiple images for per product and more. Modern and dynamic and organic WordPress theme that suitable for Tea Company & online tea shop. As well as perfect for your organic tea firm, coffee store, gift shops, and food & drink shops. It has initiative and visual interface that look more informative. 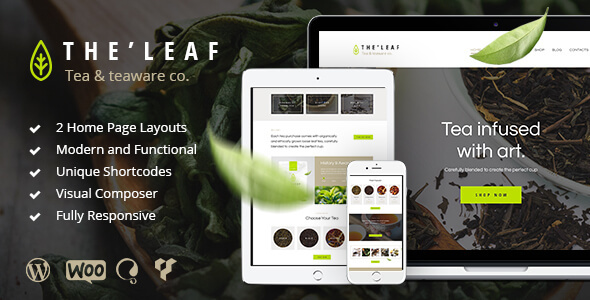 TheLeaf also 100% fully responsive theme with retina ready features. 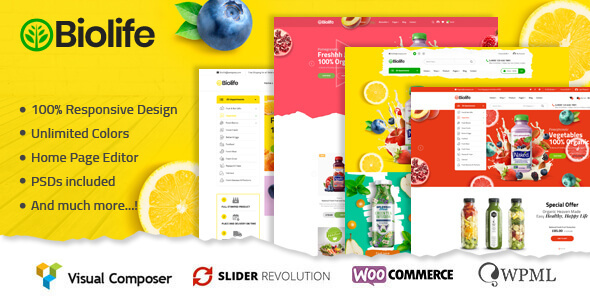 It also compatible with most popular WordPress plugin such as slider revolution to make a stunning slider to your homepage design, WooCommerce to create and manage shop page to sell your products or services online and make additional cash. Essential grid plugin to make grid layouts in your website if needed, as well as great support for WPBakery page builder to set up your own home and a custom page with drag and drop features. Highly optimized with all devices that show swipe effects, revolution swipe, and responsive layouts. For the shake of the demo, it has 2 homepage layouts with a unique design. Greatly support for WPML plugin to translate your website into multilingual. And more features from TheLeaf such as shortcode builder, free support and updates for buyers, custom theme options panel, PO composer and much more. Would you like to make your offline line store to online store to sell your organic food like Vegetable, Fruits, Juice etc. Biolife is perfect WordPress theme for your organic store website. Various home page layout that all are sell optimized. Biolife WordPress theme build with Top WordPress plugin Visual Composer for drag and drop page building, WooCommerece for online product selling and payment accept. Slider revolution for nice looking header slider for homepage and inner pages and WPML to make your store in multi language. Well rated by previous buyer so far. You can start your online store within coupe of clicking and short turnaround time. Are you worried you don’t have technical knowledge no worry author have created well written document with detail description about how to manage your website from back-end. Are you running flower shop? And looking for best wordpress theme to make online flower shop? Look at GreenMart WordPress theme once before move forward to other theme. This is perfect theme for online flower shop website. Unique product features we have noticed in this theme are Variable Product, Grouped Product, Affiliate Product, Product Countdown. So you can sell any kind of product with theme. You can create product countdown to attract user that will increase your sell. One best features theme have is compare product so user can compare and buy product. So your online store become more trusted than other. If we talk about back-end features then this theme is build using WP Bakery Page builder, Slider revolution, WooCommerce and MailChimp to collect user email. So it’s make more easy for you to manage website from back-end. For e.g. Add product, Edit product, Manage order etc. Organie WordPress theme designed exclusively for organic related businesses website. 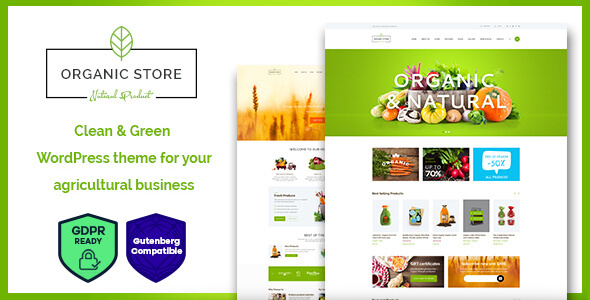 There are 12 beautiful homepages for organic store & farm, cake, plant & flower shop. Are you looking for features like Filter by price, Compare buying, Add to wish list, Labelling option to your online store. Organie is one of the best organic WordPress store. Theme is fully mobile responsive so it will work well on all devices no chance to miss any user. Theme have unique demo for each concept. Design looks minimal but very attractive. Slider revolution and WP Bakery page builder integrated without any additional cost. Smart back-end so it’s very easy to manage everything from WordPress dashboard. You share your tips and other info to your customer by writing blog on your website. Generally we collect and add modern and latest release WordPress theme to our blog but we are adding Organic Food because It have good sell and rating so far with unique concept of Organic website. Organic Food is fully mobile responsive wordpress theme for your bakery shop. 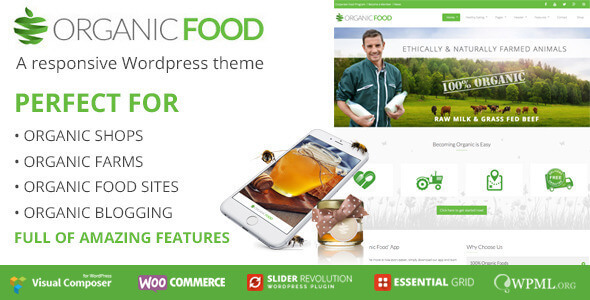 Organic Food bundled with top selling WordPress plugin like Visual Composer, Essential Grid, Slider Revolution, WPML. For that you no need to pay extra but you will get a ton of back-end features that will make your efforts easy. Initially if you want to start just blogging related to organic food then also this theme is perfect later you can start selling your product for various categories.